WILL “IRON FIST” TACTICS BE FORCED UPON THE USA DUE TO CIVIL UNREST? THE USA IS NOW AT A CRITICAL CROSSROAD: If the liberals get back in majority power the nation will move rapidly toward a socialist state with far less individual freedom, which comes with the territory. And if the republicans hold on to the majority power the nation will avoid going the socialist route, which will keep our individual freedom safe for the foreseeable future. I’m going to make this short. As a self-made writer with little former education, but I am blessed with almost super natural wisdom. I see “Iron fist” tactics at a distance on the horizon soon coming to the USA. I believe the overwhelming amount of U.S. citizens of common sense and sound judgment is coming to a very rude awakening concerning liberalism, and don’t like what they see. No nation can put up with out of control mass civil disorder and unrest for very long before people of common sense and sound judgment starts demanding some form of very strong discipline, just to maintain peace and order. And I’m afraid the liberals are only just beginning to push the envelope. However, I believe the biggest mistake that could never work is for the USA to be forced into going down the “Iron fist” road, which would demand more and more force and cost our individual freedom to be lost forever. Never forget the only strong societal discipline system that will allow individual freedom on a mass scale is a genuine true free market place economy, minus any federal minimum wage law, period. 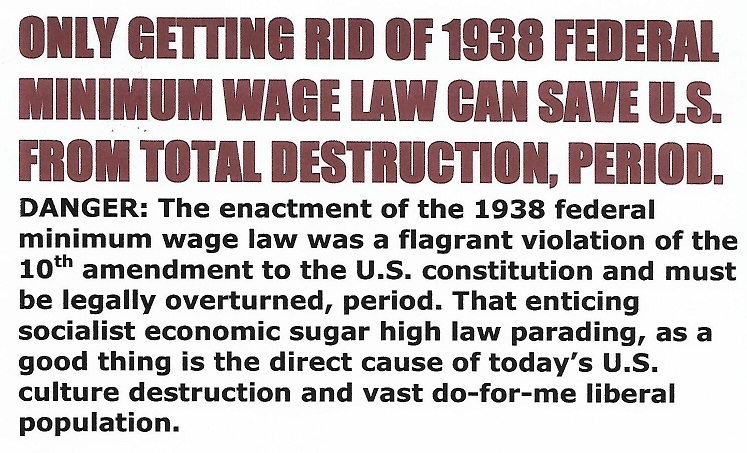 The 1938 federal minimum wage law is what set in motion the destruction of our USA culture, which cannot be save until that law is repealed. My great wisdom tells me: The USA is split almost straight down the middle ideological wise and only some form of very strong societal discipline can possibly save us. I don’t believe we have seen anything yet as to the depth and limit liberalism is going to test this great nation. Nothing on earth has more raw disciplining power than a true free market place economy that doesn't have any price or wage law to hinder its awesome natural purging power. It can and will get the job done to save this great nation if given a chance, period. In fact a true free market place economy is the only thing that can possibly save the USA as a free nation with our individual freedom still in tact. It’s far too late for anything else to save this great nation with its culture in almost total ruins. That is the result extreme liberalism has brought this great nation to in the view of this writer. But, why put all of the fault and blame on the liberals, they are only doing what their shallow minds think is right to them. When you know better you are suppose to do better. Someone said, "All it takes for evil to triumph is for good men/women to do nothing. It took a lot more than irresponsible liberals operating a free candy store to bring about this huge welfare state we have today. The course of least resistance overcome many that knew better, who went along just to get along, period? Now, A failed culture may have produced far too many liberals to save this great nation from itself, which is due to a lack of enough societal discipline in the first place. By operating a free candy store the liberals held on to the U.S. house of representatives for 40 consecutive years, thank God for Newt that grip was finally broken.